What if you could gather up all the shattered and scattered pieces of your broken heart and surrender them to a Master Artist who would then piece it back together into a BEaUtiful work of heART? A powerful kind of Kintsugi of the Soul! Kintsugi is the Japanese art of repairing broken pottery with a lacquer mixed with powdered gold. When an object is broken, rather than discarding the damaged and broken, the pieces are mended, and cracks are filled with precious metal and, in many ways, make the object more beautiful than it was at the start. As a philosophy, it is rooted in the inherent beauty of all objects, no matter what they’ve endured. The philosophy behind kintsugi is the same one that inspires The Creator’s Healing Power—Restoring the Broken to Beautiful, the second book in the Bible Studies to Nurture the Creative Spirit Within series by author Jody Thomae. In The Creator’s Healing Power you will discover a path to healing with a focus on artistry, beauty, creativity and worship. Based on the Formational Prayer Model developed by Dr. Terry Wardle, The Creator’s Healing Power is an in-depth and interactive Bible study exploring the connection between healing and creativity, prayer and redemption, surrender and beauty, worship and wholeness. 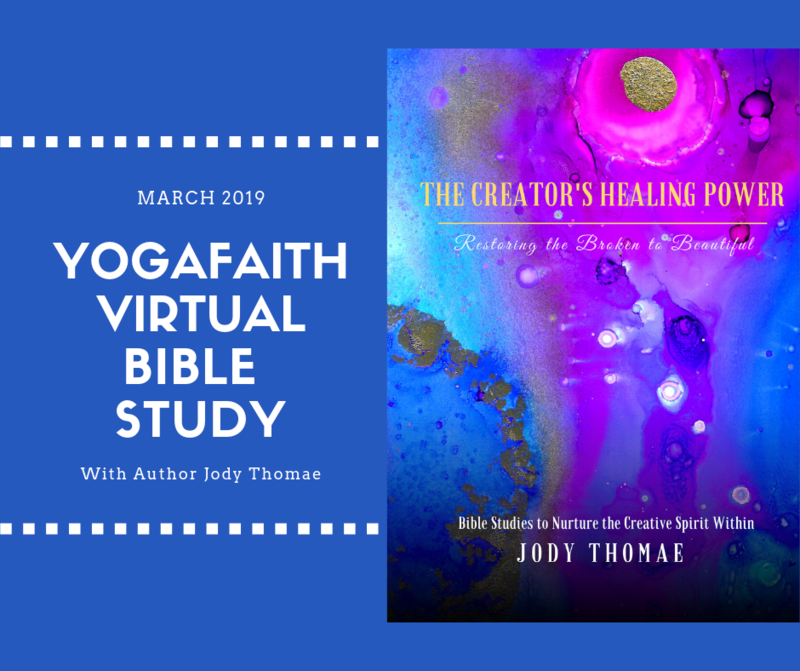 Join the author and YogaFaith’s own, Jody Thomae, as she guides us through a Virtual Bible Study of The Creator’s Healing Power. You’re invited to join us live on four 75-minute phone calls with Jody. The calls will include prayer ministry time and also be recorded for later playback. You’ll also be a part of our private Facebook page where you can share your thoughts and get to know others in our YogaFaith tribe. Are you ready for Jesus to restore the broken places within? Let Jesus Christ, the Master Artisan, fill and heal the shattered places within. Join us as we seek him together.